Mr. Park Hyo-Nam receives "L' Ordre du Merite Agricole" from French Amb. Phillippe Thiebaud at Hilton Seoul on July 21, 2006. 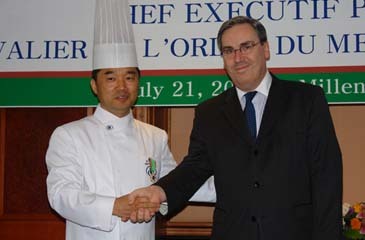 The Millennium Seoul Hilton is most honored to announce that its own Executive Chef Park Hyo-Nam (45) was the latest recipient to be awarded "L'Ordre du Merite Agricole" on July 24, 2006. A special ceremony took place at the Millennium Seoul Hilton Hotel on July 21, 2006. Executive Chef Park was honored with "L'Ordre du Merite Agricole," a prestigeous decoration that is presented by the French government to individuals who have contributed significantly to the field of agriculture. 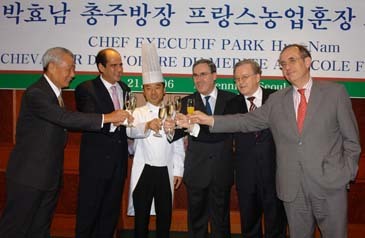 French Ambassador to Seoul Phillippe Thiebaud delivered a congratualatory speech and decorated Executive Chef Park with the order at the ceremony. Executive Chef Park was bestowed this honor for his decades of devotion and hard work in the field of French cuisine. He is acknowledged as one of the driving forces advancing the level of French gastronomy, not only in Korea, but in the international arena. He is the only Korean national to be appointed executive chef in Hilton's multi-national hotel chain. While Executive Chef Park's duties span all nine dining outlets of the hotel, his culinary genius can be truly experienced during one of his Gourmet Circle dinners at Seasons, the hotel's French restaurant. Offered only four times a year with the changing of each season, Executive Chef Park creates an epicurean tour de force, where each dish of the multi-course dinner is a culinary triumph. Guests congratulates Mr. Park Hyo-Nam for his receiving "the Ordre du Merite Agricole" at Hilton Seoul on July 21, 2006. In this year alone two South Korean nationals received the prestigious order. President of the Best Home Hong Sung-Chul and Managing Director of Gourmet F&B Korea Suh Jae-Yong received them for their contribution to the development of mutual ties between South Korean and France. This year is the 120th anniversary of French-Korean diplomatic relations. The first Korean recipient of the medal was Mr. Suh Han-Jeong, president of the Korea Wine Society. He received it in 2000. In 2005 Mr. Kim Ho-Youn, president of the local confectionary Binggrae became the second Korean to get the medal. "L'Ordre du Merite Agricole" is one of the highest civil awards in France. This award was first established in 1886 by Mr. Jules Meline, the French minister of agriculture, to recompense those who making significant contributions to the development and progress of agriculture. Louis Pasteur was one of the first recipients of this esteemed award. For inquiries please call Mr. Kwak Yong-Deok, Hilton's PR manager at 317-3014.